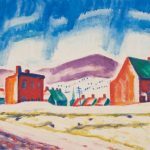 Painting the landscape, Oscar Bluemner was also painting himself, in his own unique colors. 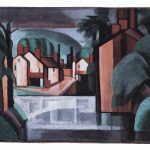 Oscar Bluemner was in many ways an archetypal modernist painter. Conservatively schooled, he achieved his mature style through a series of leaps from the comforts of the familiar to the uncertainties of the new. Having arrived at a stable style, he would pursue it for a few seasons and then abandon it for the perils of untested possibilities. This risk-taking is what we expect from modernists. Yet no avant-garde innovation is so radical that it completely severs all connection to the past. Continuities persist and in Bluemner’s case give him strong roots in the Romantic tradition that morphed into modernism in the mid-19th century. 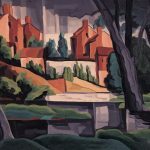 In 1916 a selection of Bluemner’s recent landscapes went on view at Forum, one of the few Manhattan galleries to show modernist art in the early years of the 20th century. The exhibition catalogue included a statement in which the artist declares that, as he recreates a landscape on canvas, it “undergoes a free transformation from objective reality to a subjective realization of personal vision.” One hears in this claim an echo of comments made nearly a century earlier by Caspar David Friedrich, German Romanticism’s leading landscape painter. “The only true source of art is our heart,” said Friedrich. Though many artists work hard to master pictorial composition and even harder to learn to represent the world’s outward appearances, this effort is for naught, Friedrich believes, unless it is guided by one’s “spiritual eye.” True seeing is inward, an intuition of the unity of self and nature that fosters “the ability to express one’s feelings through shape and color.” “All turns on ego,” says Bluemner, and so “landscape painting is semi-self portraiture”—“semi” because the “ego” is not the only subject. Nor is the focus entirely on nature. As in Friedrich’s Romanticism, so it is in Bluemner’s version of modernism: the goal of art is to evoke the oneness that encompasses self and other, subjective and objective, revealing them to be mirrors of one another. Of course, there are profound differences between Bluemner’s forms and colors and those of his Romantic predecessor. Much closely observed detail is to be found in the landscapes of Friedrich, who had a particular interest in the minutiae of tree branches and ocean foam. Many of Bluemner’s later paintings, by contrast, could be read as almost abstractions—a remarkable development in an artist who began as an architect in command of a precise, even finicky style of rendering. The artist was born in 1867 in Prenzlau, a city in northeastern Germany. Twenty years later, he would enter the Berlin Institute of Technology as a student of architecture—a choice that must have seemed inevitable. 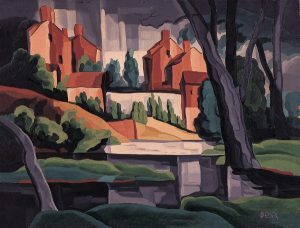 His father and grandfather were successful architects, and so was Bluemner in the years immediately following his graduation from the Institute. Having won a commission for the design of a theater, he went on to supply the government with plans for a post office. In addition, he won a gold medal for a painting of an architectural subject. Despite this promising beginning, he left Germany for America in the belief that the New World would offer greater opportunity and freedom. After a few months in the office of a New York architect, he headed west, to Chicago, to work on the building that housed the 1893 World’s Columbian Exposition. The prescribed style was Neoclassical, of which Bluemner had an easy command. Far more interesting to him was his first encounter with avant-garde art, in an exhibition of paintings by the Impressionist Claude Monet. He was impressed but not tempted to stray from the path of a young architect struggling to build a practice. Moving between Chicago, New York, and Boston, he designed houses for well-to-do clients with a taste for elegance in the conservative manner of the late 19th and early 20th centuries—generic villas with stylistic touches borrowed from Spanish Colonial and Second Empire models. It wasn’t until 1902, when he visited an exhibition of Post-Impressionist canvases in New York, that he took seriously the possibility of redefining himself as a modernist painter. In the early years of the 20th century, the avant-garde had established only a tenuous foothold in America, and Bluemner might never have launched his second career if he had not met Alfred Stieglitz. An important practitioner of what was then known as “artistic photography,” Stieglitz founded the Little Gallery of the Photo-Secession in 1905. Though many of the Little Gallery’s exhibitions were successful—critically as well as financially—Stieglitz had a larger ambition: to demonstrate that serious works of photography were aesthetically equal to the era’s best painting and sculpture. Welcoming all mediums into the gallery—renamed 291, after its Fifth Avenue address—he interspersed photography shows with exhibitions of Auguste Rodin’s drawings, paintings by Paul Cézanne, and sculpture by Constantin Brancusi. By 1909 he had begun to show the work of American modernists: John Marin, Marsden Hartley, Georgia O’Keeffe, and others. It was at 291 that Bluemner became acquainted with their art and, by giving him a solo show in 1915, Stieglitz recruited him to their ranks. Three years earlier, Bluemner had traveled to Paris, where he saw the work of Fauvists and Cubists. In Berlin he discovered Expressionism and Futurism—and showed his own paintings at the Gurlitt Gallery. Returning to New York in 1913, he was just in time to be included in the Amory Show, the immense exhibition credited with introducing the American public to modernist art. 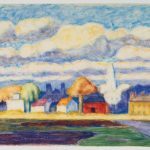 Bluemner’s paintings and drawings from this period provide strong evidence that he was still taking guidance from late 19th-century precedents—especially that of Neo-Impressionist “pointillism,” a method of building images from innumerable dots of unmixed color. Yet Bluemner was never an imitator. Extending pointillist dots into thin, vibrant lines, he wove his colors into shimmering images of sky and foliage and architecture. Bluemner’s aesthetic declarations align him with the Expressionists whose paintings he first saw in Berlin. So do his colors—serene, joyous, even rapturous. It is difficult to say whether these feelings inhere in certain hues or are associated with them by tradition. In any case, Bluemner deployed his emotional palette with such a sure hand that it is easy to overlook his mastery of pictorial composition, which he learned from the examples set by Cézanne and the Cubists. Sparkill, New Jersey, Red Mountain (1922) contrasts the lushly rounded shapes of mountains, foliage, and clouds with sharply delineated architectural forms that recall those of Georges Braque and Pablo Picasso’s paintings from 1909–10. Bluemner’s palette, however, is entirely his own. In the Sparkill painting, buildings are vehicles for the persistent reds that inspired the artist to call himself the “Vermillionaire.” Yet the mood is not always so positive. In Sunset Effect on Rain, 1929, the forms of buildings have grandeur and yet Bluemner’s colors have turned elegiac, and Winter Night, New Jersey (1930) is grim, with an array of blacks, whites, and grays predominating and red nearly overcome by shadow. The year after Bluemner’s exhibition at 291, Stieglitz arranged for his participation in a high-profile group show at the Anderson Gallery, one of the few in Manhattan devoted to avant-garde painting. In 1917 he had the first of several exhibitions at the Bourgeois Gallery, moved to the New Art Circle in the mid-1920s, and was featured at Stieglitz’s newest enterprise, the Intimate Gallery, in 1928. Bluemner was on his way to critical success. Several works in his 1929 show at the Whitney Studio Galleries were sold and then, later that year, Wall Street’s crash brought the art market to a standstill. Bluemner had occasionally supplemented the income from his art with stints in the offices of New York’s architectural firms. As the economy sank into Depression, this expedient was no longer available. Though he managed to keep working, sustained in part by stipends paid by the Public Works of Art Project, a division of the New Deal’s National Recovery Act, his isolation deepened. In 1938, despairing of any permanent relief, he committed suicide, taking his work with him into an oblivion nearly but not quite complete. 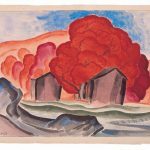 Over the years, the Museum of Modern Art, long a bastion of the European avant-garde, acquired two of Bluemner’s major works, and the Whitney Museum of American Art owns 17 of his drawings, paintings and prints. Moreover, he is a salient presence in the Whitney’s 1999 survey, “The American Century: Art & Culture 1900–1950.” O’Keeffe, Hartley, and Marin have long been celebrated. 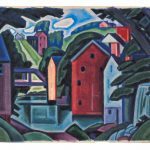 Now that Bluemner is receiving an increasing share of attention, it seems odd that the art world ever neglected his vision of the American landscape—or, one might say, of America itself—in moods ranging from passionately welcoming to grandly foreboding.